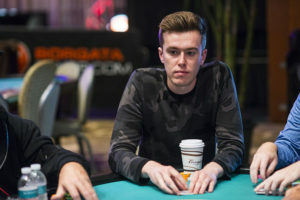 Prominent American poker pro Gordon Vayo has filed suit against global online poker market leader PokerStars over more than $690,000 in frozen winning from Vayo’s triumph in a 2017 SCOOP (Spring Championship of Online Poker) event. The lawsuit promises to center on the use of VPN (Virtual Private Network) connections, with open questions existing as to whether Vayo has used such a hookup — through which a player’s physical location is often disguised — when playing from otherwise banned jurisdictions. PokerStars does not allow players to participate from within the United States, though many, many hundreds of American online players have been allowed to “reflag” themselves by setting up temporary work residences in other countries. According to the complaint, Vayo has established two such international residences in the years since 2011’s United States “Black Friday” crackdown, one each in Canada and Mexico. Vayo’s lawsuit asserts that he was in Canada during the 2017 SCOOP event, which he won after a four-way, final-table chop. However, in a matter of seeming relevance to the case, Vayo filed the lawsuit in his US state of residence, California, thus to emphasize the suit’s claim that PokerStars has conducted a pattern of fraudulent inducement enticing high-profile, wealthy American players, only to force them to provide physical proof of non-US presence after they’ve made a major score on the site. The false-advertising claim under the US’s Lanham Act provisions allows for trebled damges to be awarded. Others of the claims allow for additional punitive damages, which in addition to attorney fees, court costs, and interest could swell the basic $692,400 claim to something approaching $3 million, if PokerStars was found liable on all claims. PokerStars will likely focus on possible BPN use by Vayo in his defense. Within the complaint, Vayo and his counsel admit that Vayo suffered a “VPN malfunction” at other times during 2017. PokerStars has alleged, in emails reproduced within the body of lawsuit, that Vayo played up to 56,000 hands on PokerStars while using a VPN, a claim that Vayo and his attorney heatedly contest. The lawsuit itself includes the allegation that PokerStars continued a freeze on Vayo’s account because he had not provided sufficient documentation of his physical whereabouts on May 22, 2017, the last of three days in 2017 SCOOP Event #1, which Vayo won. A part of Vayo’s countering claim is that it is unreasonable for PokerStars to demand such proof of physical whereabouts on a day-by-day basis, months after the fact; Stars had allowed Vayo to play on the account and end money from it to other players for some two months after his win, but only froze his account after he attempted a major cash withdrawal of his winnings. That Stars froze Vayo’s account after doing a more comprehensive check into Vayo’s play following the withdrawal request is an argument in Vayo’s favor; as several commenters have noted, performing such checks only after large withdrawal requests is a de facto tax on winning, not on playing from a banned jurisdiction such as the US. However, Stars is likely to counter with evidence of Vayo’s other VPN use, if indeed he (or someone using that account and computer) played on Stars from the US. Such “fruit of the poisoned tree” arguments might provide legal justification for Stars’ freezing of Vayo’s account, even if the timing of that freeze opens additional concerns. There’s also the jurisdictional question: Why would Vayo file suit in California, if the Stars account (and supporting bank account) that he used were both based in Canada, as claimed? The case promises plenty of rotten eggs all around, and it may force the entire industry to take a sharper and more restrictive look at the use of VPN’s by players. No court date has yet been set in the matter, though Vayo’s counsel has requested a jury trial and threatened to make the matter into a class-action case. PokerStars is currently within a 21-day subpoena in which it is expected to make its initial filing in the case.